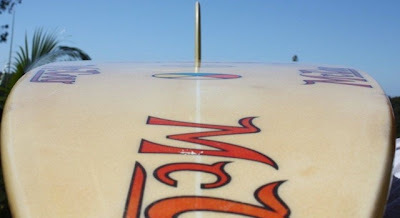 : Board Collector: Riding Waimea on a 5’ 8” Mc Coy Lazor Zap, by Cheyne Horan and Geoff McCoy. Riding Waimea on a 5’ 8” Mc Coy Lazor Zap, by Cheyne Horan and Geoff McCoy. I'm proud to be able to share with you the third instalment of the account of the development of the Lazor Zap, no nose surfboard design by Cheyne Horan and Geoff McCoy. I am deeply honored that Cheyne and Geoff have decided to share their personal account and photographs from the period with us here. 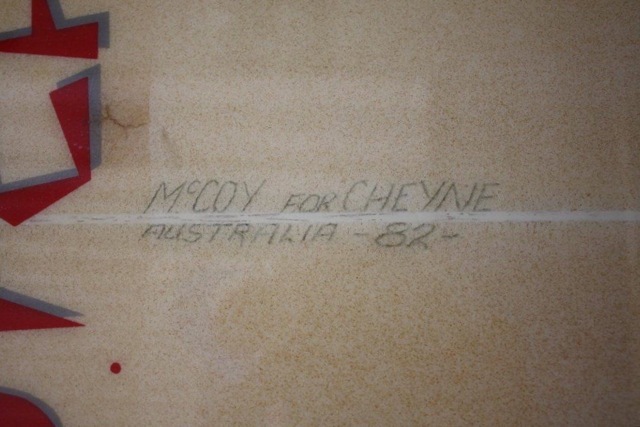 "Cheyne had wave awareness that no one else had at that time and very few have to this day", says Geoff McCoy. 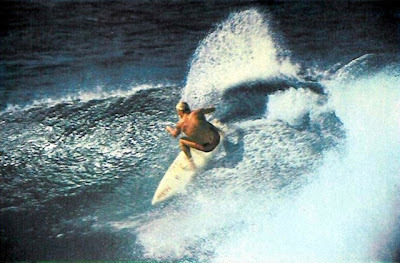 Cheyne continues, "Small boards can’t be ridden in big waves, was the call from the general surfing fraternity in the late 70's and early 80's. At this time I wanted to change surfing’s approach and attack on a wave, when people went down I went up, when they went along the bottom I went along the top. So when they said you can only ride long boards in big waves I rode small and this board is the first one. 5’ 8” McCoy Lazor Zap, can you imagine how excited Geoff Mc Coy and I were in the shaping bay knowing we were about to change the way that surfing in big waves was perceived. At the time I just wanted to surf Sunset. Geoff put everything into this shape. He spent many hours considering what to design for the mission we were attempting to achieve, it was a whole new experience to design and shape a small board that would perform in such conditions, this board had to perform and do what no other board had ever done before. He decided to use longer flatter curves in the bottom and a little straighter curves in the plan shape to achieve longer faster performance, the rails were opened up and softened to assist with extra hold and control. 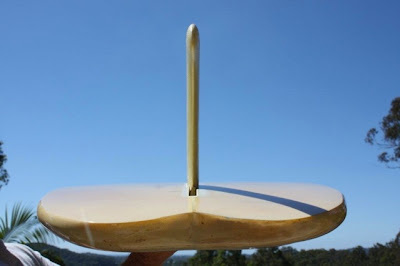 These features allowed the short board design to run longer arcs that are necessary on larger waves without losing control. The fin we designed was known as the "Finger Fin", very narrow base area with a long extended tip area, this allowed the board to run long arcs because of the length of the tip area that was deeper in the water, at the same time the narrow stem allowed for easy turning, it was a very successful and practical design for its needs. Paddling out at out of control Sunset no one out or around the beach, the ultimate test was about to happen, will it work? can I catch a wave of this magnitude? Yes, I was scared, the waves were hairy and if I wiped out I was on my own. After a horrendous day surfing, it was clear to me that small boards can surf in big waves, after surfing massive faces with a board that could turn tight and long I was convinced after riding Sunset, now the next step was Pipe. One cloudy windy afternoon Pipe was 10-12ft barrelling only a few guys out, I knew the take off point and I got in relatively easy and dropped in vertically and on edge and making it after a few it felt like a beach break so I started to try and hit the lip. On one wave I went up inside the corner of a tube and rode on the roof almost upside down and turned and flew onto the face, it was insane! Gerry Lopez was paddling out and saw it happen he later said to me "that’s the most radical turn he’d ever seen out there”. This was an amazing achievement for the design of the board and for me. As it was generally known that you do not ride the same design board at Sunset and Pipeline, as they are completely different waves that up till now required totally different board designs. This was mind blowing stuff! I wanted to keep going, take it to the limit and beyond, so the next challenge was even greater. Feeling like I was making fresh imprints on the planet, pushing surfing’s limits to the max, this is right where I wanted to be. Next thing I know I find myself out at 20ft Waimea on this 5’ 8” and feeling like this can be done, riding Wiamea on the smallest board ever to paddle out there. I was sitting right in the take off zone with the local Hawaiians very much behind me doing this. They would tell me "here comes the set" and watched intently to see if I could even catch a wave. I was sitting right on the ledge and dropping in just under the lip, ridding down the face like it was on a 3ft wave going down the wave like I was going along a wave, I would turn 3ft one way then back or get in a valley, crevice, down the face and stay in it ridding the valley like a small wave, having some great rides. On one wave I nearly went off the lip and did a radical snap in the pocket. It was over whelming stuff. I found it hard to believe myself, what I had achieved on this amazing 5’8” designed by Geoff McCoy. I couldn't believe what it was capable of. The Hawaiian’s that assisted me in the achievement were blown away and stoked. It was a talking point for quite a while on the North Shore that winter and I felt like I had climbed Mt. Everest without oxygen! There is one wave at Wiamea that colonel Benson featured in “Follow the Sun”. 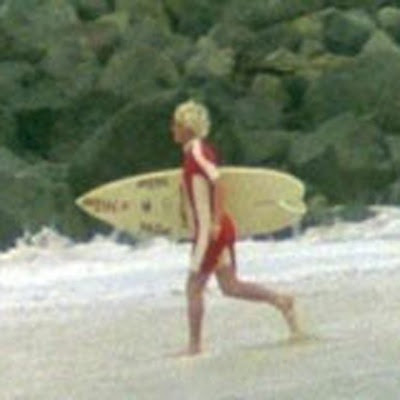 I don’t know why they didn’t put the whole session in, the wave he puts in the fin disengaged on the way down, I had many times this happened when the waves had lots of chop. I now know it was because my fin was too thick. There were more waves where everything clicked and the board rode perfect but these rides were not shown. The skeptics and power brokers of the day kept trying to discredit almost everything we had done, preferring to focus on any small negative aspect they could find rather than give credit to the sense of adventure Geoff were designing for and my own ground breaking achievements. Breaking the molds, challenging traditions, always ruffles the feathers of the establishment. They said we were crazy trying to design and ride small boards in big waves, yet here we are, some thirty five years later, and today that's exactly what tow in surfing is proving works. When we were doing what we did back then we always knew we were way ahead of our time. The truth is Geoff still is today. Many thanks to Laurie, Cheyne and Geoff. Big props & credit to Cheyne Horan & Geoff McCoy for taking on Waimea, Sunset & Pipe on such small equiptment and proving to themselves and everyone else that it could be done! Rovolutionary! Good on ya mates! Mahalo for sharing the story Damion. Awesome story. 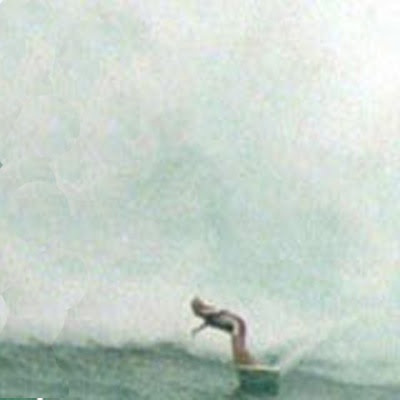 Back then they were saying that short board were not for large waves. Most still say that wide tails are not for large waves, this Lazer Zap story also proves that wrong as well. How wide is that tail, any idea? Good stuff. Awesome read. Cheyne wave artist.